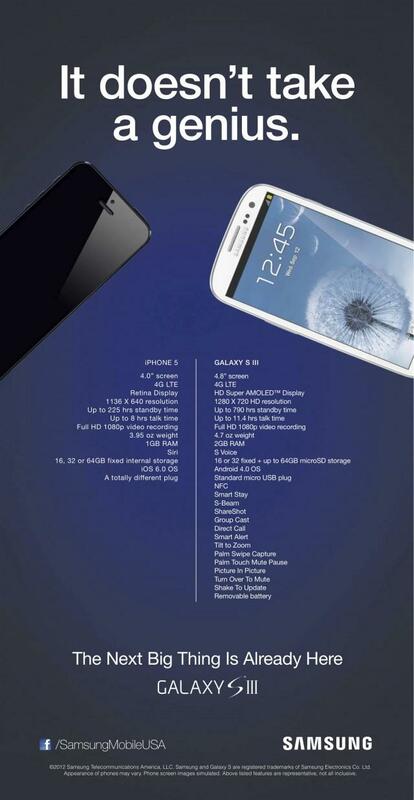 A Samsung ad revealed on Saturday pits Apple's new iPhone 5 directly against the Galaxy S III, listing the two handsets' features side-by-side in what appears to be a highly subjective comparison. Titled "It doesn't take a genius," Samsung's new print ad obviously references Apple's widely-panned TV spots and customer support representatives, called "Geniuses." Ironically, Samsung's ad also serves to point out that the company does not offer the same level of hands-on customer care. The main thrust of the advertisement is to illustrate the huge amount of features the Galaxy S III has over the iPhone 5, with the extremely long list of trademarked smartphone functions doubling those found on Apple's new device. Going further, most of the tech specs Samsung chose to attribute to the iPhone are trumped by its own unit. Things get a bit tongue-in-cheek when Apple's new Lightning connector is mentioned, of course as a negative, with Samsung describing the part as "A totally different plug" versus the S III's "Standard micro USB plug. While not unexpected, the ad fails to mention the numerous enhancements coming with iOS 6, Apple's mobile operating system that some say gives the company an edge over other smartphone makers because it can tailor the software and hardware in-house. The fact that Samsung's handset uses a year-old version of Android was not mentioned. Samsung's ad is scheduled to go to press on Sunday, though it is not clear what publications in which it will be running.